Following his award-winning documentary The War on Democracy, John Pilger's new film is a powerful and timely investigation into the media's role in war. 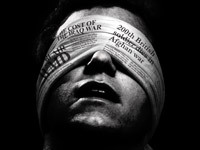 The War You Don't See traces the history of `embedded' and independent reporting from the carnage of World War I to the destruction of Hiroshima, and from the invasion of Vietnam to the current war in Afghanistan. As weapons and propaganda are ever more sophisticated, the very nature of war has developed into an `electronic battlefield'. But who is the real enemy today? Other films by John Pilger are The War on Democracy, Breaking the Silence, Stealing a Nation, New Rulers of the World, Palestine is Still the Issue, Paying the Price: Killing the Children of Iraq, Inside Burma, and the four films in the Documentaries that Changed the World series: The Quiet Mutiny, Death of a Nation, Year Zero: The Silent Death of Cambodia, and Do You Remember Vietnam?. "This film confirms Pilger's credentials as one of the few remaining independent investigative journalists operating in the highly promiscuous environment of 'embedded' war correspondents and spin doctors...In order not to forget the dirty tricks and outright lies produced by our rulers in the name of freedom and democracy, The War You Don't See should be required viewing for history and journalism students, if not everybody who is a concerned citizen in today's complex world." "John Pilger is at his best when he details what the American and British news media rarely show--the human carnage at the receiving end of the missiles, bombs and bullets their governments so casually spray at Iraqis, Afghans and others. The War You Don't See also does a masterful job of laying out the often willing collusion of the journalists with the governments' ever-expanding spin empires in an era of seemingly permanent war. It is a useful documentary to shake the complacent and generate much-needed discussion." "The War You Don't See graphically shows how today's brutal wars and occupations in Muslim countries are made possible by mass media serving up propaganda rather than independent journalism. The film allows top media figures to defend their coverage--which makes Pilger's case even more persuasive. As does the footage from World War I to Vietnam to our ongoing military occupations that cause so much civilian hardship seen by so few in our country." "If this film doesn't cause students to be skeptical about the reliability of mainstream media news I'm not sure what else will do... It is implicitly suggested that the major dimension of warfare--the victimization of innocent people--is typically ignored or minimized unless enemy combattants are deemed responsible. Reports from the front, even from the best journalists, tend to come with a nationalistic bias. The heart of this film is a series of well over a dozen probing interviews Pilger conducted with analysts including prominent news reporters and government officials. They describe how reporters are typically dependent upon government officials for their information and thus their livelihood...The present generation of students may be surprised by some of the most disturbing facts that Pilger asserts but they can be independently verified or reinforced by competent instructors." "A subject that can't be revived enough: the grotesque myth of 'weapons of mass destruction': a cloudy concept, eagerly amplified and lent credibility by credulous and submissive journalists who, after 9/11, lost their nerve en masse." "Wonderfully researched and outraged...This is another intrepid and important film." "Compelling, hard-hitting...Reveals a repeated and widespread failure on the part of mainstream television media to objectively scrutinize or distance itself from governments' official line or indeed propaganda." "Is easily the most important film of the last 10 years and, I would argue, the most important documentary of all time...Inspiring and thought-provoking...gut-wrenching, harrowing and downright disturbing." "John Pilger's documentary tells you like it is, revealing how our own war crimes are portrayed and justified in media compared to the reality. And it's not pretty...Watch and learn." "Pillories the American and British mass media for failing to question their countries' military policies." "Is unique in providing coverage of the British media. Highly recommended for viewers interested in how media have addressed armed conflict." DVD includes an exclusive 68-minute interview with Wikileaks founder Julian Assange, SDH captions for the deaf and hard-of-hearing, and scene selection.